The upcoming boxing match between Floyd Mayweather and Manny Pacquiao has set the stage to become one of the most bet on matches. Las Vegas sportsbooks, not to mention online as well, have seen that fans and gamblers alike have flocked to and are betting large amounts of money on this particular fight. The Mayweather-Pacquiao fight will take place at the MGM Grand Garden Arena, which makes it the fourth largest handle for a fight at that casino. 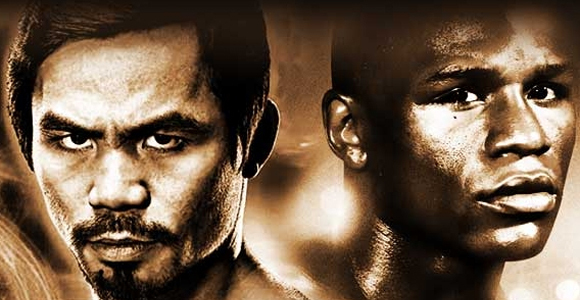 The odds at these sportsbooks are largely skewed, giving about -225 odds to Mayweather, and +175 to Pacquiao. With this, they have seen that a lot more people are betting on the underdog, Pacquiao. Seeing ratio of 3 bets to 1 at MGM Grand, and 7 bets to 1 at the Westgate Las Vegas Resort and Casino. Even with this occurring, the sportsbooks feel confident they won’t lose any money. The reason for this is that, although more people are betting on Pacquiao, larger bets are being placed on Mayweather to win. In the end, between the inflated odds on either end, and the amounts that people are wagering, the sportsbooks will end up turning a nice profit, regardless of which boxer wins. The fight doesn’t take place until May 2nd, and still with a few days left, people are still betting large amounts of money. Many sports-book managers even agree the odds should be further apart than they already are. All of this hype has made it possible for anyone to place a $200,000 bet without needing the approval of the manager. This is working its way to becoming one of the highest bet on boxing fights of this decade.